Bird Dog Coolers Review – Your New Outdoor Best Friend? For the outdoor enthusiast, nothing is more reliable than a good bird dog. Even if you aren’t a hunter, a bird dog symbolizes intelligence, loyalty, and reliability. So, when we heard about the launch of a new line of coolers called “Bird Dog”, we just knew we had to put together a Bird Dog Coolers review. Introduced in late 2017, the Bird Dog Outbound Cooler collection made by Bird Dog Coolers is to give the avid outdoor adventurer a heavy-duty option to pack their favorite drinks in, with enough room to pack out their catch after a solid weekend of fishing. 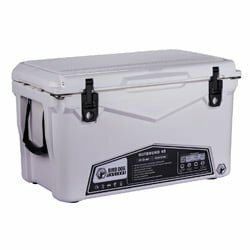 Using similar techniques of better-known brands, the Bird Dog ice chest line-up offers solid coolers for a reasonable price. In order to stand up with the big names in coolers, such as the Yeti, Pelican or Orca, the Bird Dog Outbound coolers need to have a serious line-up of features that make them tough enough to stand up with the big names in coolers. Bird Dog Outbound coolers come in three different sizes that are good for meeting the needs of a wilderness excursion. The three sizes available from Bird Dog are 20, 45, and 75 quarts. Each size features the same rugged and durable rotomolded construction. 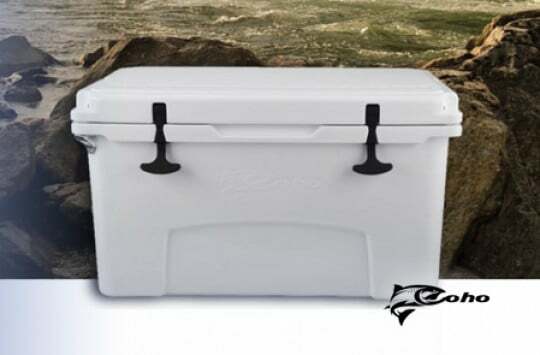 The thick walls are ideal for the outdoorsman that wants more than a show cooler to impress his friends and look good. 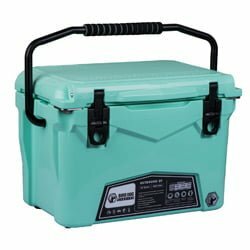 These coolers aren’t nuclear fall out proof, but you can take them out and subject them to a little abuse without having to worry about crack or leaks. 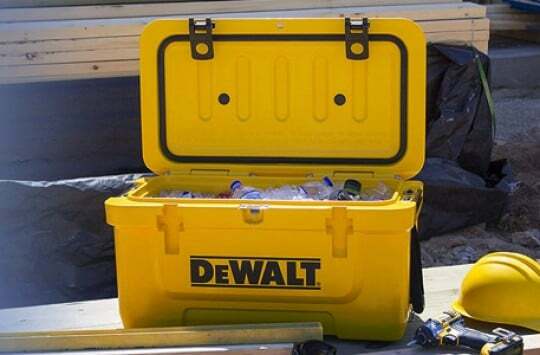 The body of the cooler is made from a single piece mold that eliminates seams and weak points that are common with thinner and weaker coolers. The think walls of the Bird Dog Outbound and the efficient insulation are rated to keep ice in solid form for up to five days, as they claim, although we at bestcooler.reviews think that this claim might be a little bit exaggerated. The snap-tight latches create a vacuum like a seal to prevent the cool air from escaping, and warm air from invading. 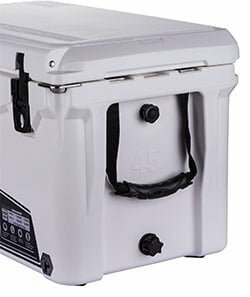 The latches are recessed into the body of the cooler so they can be low-profile enough to prevent snagging on your gear and clothes. 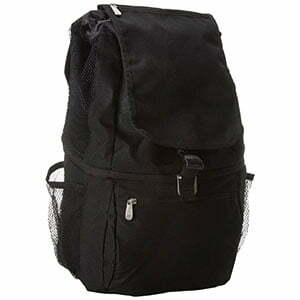 The side carry handles on the 45 and 75-quart models are made of nylon with rubber handles. 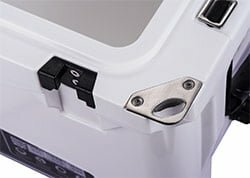 Instead of the usual stiff plastic, these handles tuck away easier and are more flexible for carrying the coolers out and back. 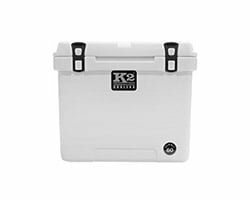 The 20 quart has a thick plastic top handle with a foam sleeve that makes carrying easy and comfortable. No mark rubber feet round out the bottom of the Bird Dog Cooler to help keep it from slipping and sliding around the truck, or the kitchen floor back home. If we weren’t quite satisfied with the basics of the Bird Dog ice chest, the additional features really make this new dog stand strong in the pack. Included standard with you cool is a dry goods basket, great for keeping your moists moist and your dries dry. The cooler also has cup holders and a cutting board. The cup holders are a much-appreciated inclusion, and the cutting board helps save space for stowing gear. To top them off, Bird Dog throws in fishing pole holders. For those outdoor thrill seekers with an eye for fashion, the Bird Dog Outbound comes in one of four colors to catch your eye; hunter green, white, tan, and seafoam. Is this Bird Dog Ice Chest Worth its Weight? With more and more people shifting to the attractive outdoor lifestyle, lots of companies have begun to manufacture similar coolers. The Bird Dog Outbound collection doesn’t offer much in new or innovative features. 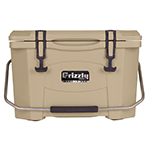 However, where it does win major points is offering a solid cooler at a lower price than other manufacturers. This is largely thanks to the “made in China” manufacturing. Still, it is nice to know that you can get quality and reliability at a lower price. One feature that we think adds weight to the Bird Dog cooler is the 5-year warranty from the manufacturer. Five years is a long time for a piece of gear that is used as frequently and goes through a lot of abuse. 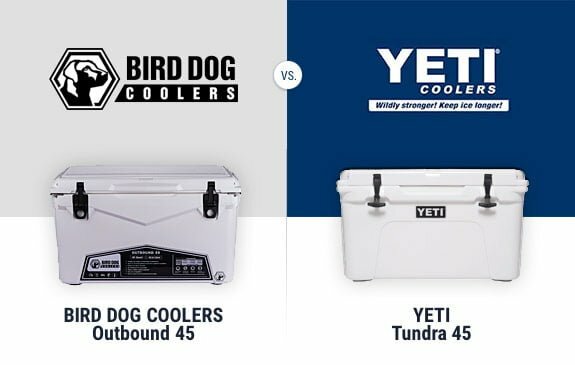 So, we’ve already established that the Bird Dog has a lot of features of other coolers, at a lower price, but does the price difference really equate to quality on par with an established successful brand like Yeti? Well, for starters, the Yeti Roadie 20-quart cooler has a leg up on the Bird Dog thanks to its 3-inches of permafrost insulation that enhances the “keep cool” capability of the Yeti cooler (read full Yeti review here). 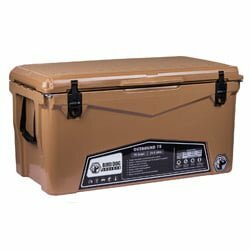 Both of the coolers are roto-molded that gives them an impressive level durability, and even without the permafrost, the Bird Dog keeps things nice and cold. One of the major differences in the Bird Dog Cooler vs. Yeti matchup is the availability of cooler sizes. Since they are so new, Bird Dog only has three available sizes (20, 45, and 75 quarts), whereas the Yeti lie has a multitude of sizes to meet your exact wants and desires. 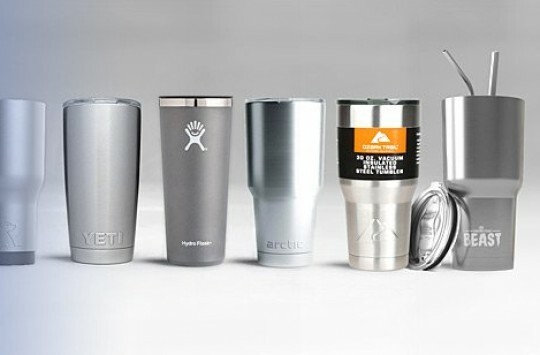 If you are looking for a variety of sizes and colors then Yeti may just be the better option for you. While Yeti has a strong history of performance that you can confide in, the newer Bird Dog Outbound coolers offer a great opportunity for a buyer to jump into the world of tough outdoor coolers for a lower price. This will help newer outdoorsmen or budget concerned explorers get their feet wet without sacrificing quality and features. You may feel like you are taking a gamble on a lesser known cooler, but the Bird Dog is shaping up to be a new contender for the top of the list. Currently, one good place to buy the Bird Dog Outbound collection is on Amazon.com. We mentioned before how this is a newer brand, and while we think it has some serious potential it is nice to have some back just in case. Amazon is very good at backing up all of their transactions and usually offers free two-day shipping (especially if you’re a Prime member). Even though you get a 5-year warranty through Bird Dog, Amazon should back up your purchase if you aren’t satisfied, and they are often quicker in resolving problems than other retailers. 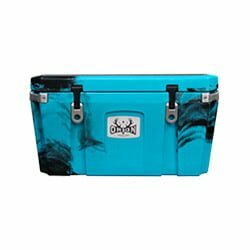 You can also pick up a cooler at BirdDogCoolers.com. You will be buying directly from the manufacturer which lets you link directly to them. The downside is that they have a slower processing time and charge shipping. We set out to provide an honest Bird Dog Coolers review, and, in the end, we feel that this is a great budget option that holds its own against similar budget models like Vibe, nICE, Milee or Driftsun. 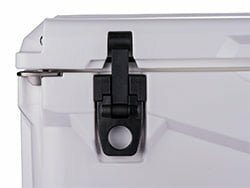 While you don’t get the cooling power of the Yeti, you still get a strong and durable cooler that has some great features, like roto-molded single piece construction, low profile latches, and (maybe most important) dual bottle opener lock plates.